Storybrook Log cabin is the ideal spot for your Story, Indiana vacation. Whether you are visiting the Brown County State Park's horse trails, or visiting some of the entertainment venues in Story, the Storybrook Log Cabin is the perfect place. 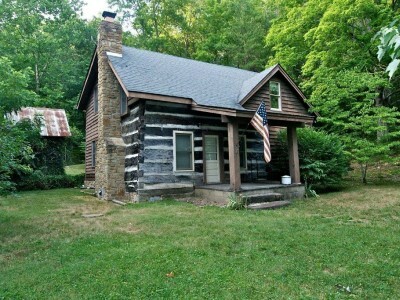 This two story log cabin has all the charm of an 1800's log cabin, but equipped with all the modern amenities of today. On the main level, you will find a warm, inviting, living room with a wood burning fireplace. The oversized kitchen/dining room area is guaranteed to be the favorite gathering place. This kitchen is equipped with everything you would possibly need to prepare an old fashioned country meal. Also, on the main level, you will find a bedroom with a double bed and a full bath. The master bedroom with a brand new queen size sleigh bed is located upstairs, along with two other bedrooms, one with a double bed, and one with two twin beds. There is also a full bathroom with a shower and separate claw foot bathtub. Storybrook Log cabin is situated on seven wooded acres. There is plenty of flat ground for walking and discovering the beauty of Brown County. Behind the cabin, there is a small frog pond, babbling creek, and a camp fire pit. Just beyond the creek is the ideal neighbor- Brown County State Park! You will enjoy exploring nature at its finest, while relaxing on the back porch area. Watch deer and other wildlife while enjoying a meal at the picnic table. Storybrook Log cabin is located in Story, Indiana, approximately 12 miles from Nashville and just minutes from the Brown County State Park entrance.